221B Baker Street — where exactly? The real location of Holmes and Watson’s address has been a source of heated discussion for nearly 130 years. 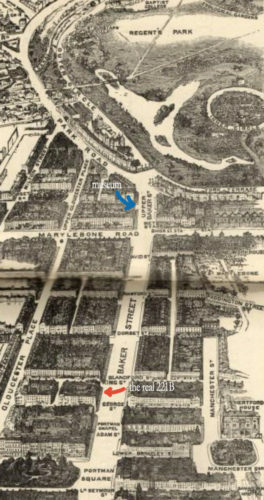 The Sherlock Holmes museum which is located on what was once called “Upper Baker Street” claims the address now (blue arrow), but it was previously thought to be located at the site of a bank on the corner just south of there. But according to Sherlockian expert Roger Johnson and other scholars, the very vivid description of the route Holmes and Watson took leading up to hiding in The Empty House (from the tale of that name) in order to trap the villainous Captain Moran absolutely confirms the true location as what is now the salad restaurant “Tossed”(sadly in a modern, post-war building) much further south along Baker Street. This antique map shows the museum location(blue arrow) and the “real” one (red arrow). 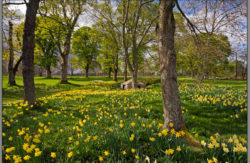 A close look indicates greenery in back of the “real” location and that corresponds with Watson’s description of a plane tree in the yard behind their flat in “The Adventure of Thor Bridge”. It should be noted that the author has frequently sensed the presence of a ghostly set of 17 stairs when entering Tossed to place her spinach and chicken salad order. This handy little booklet which Holmes mentions was an American publication, whose full title was The Complete Practical Distiller: Comprising the Most Perfect and Exact Theoretical and Practical Description of the Art of Distillation and Rectification by M. LaFayette Burn was first published in 1853 and gave explicit instructions on how to create various tinctures, cordials, brandies etc. 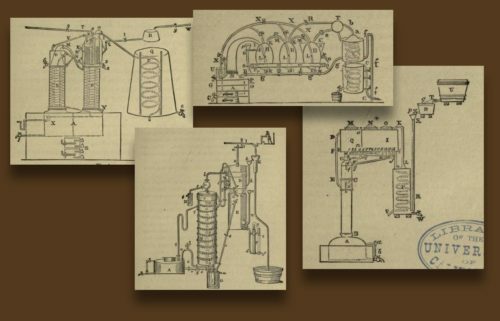 The eighth edition, from which these illustrations of various home-brew stills were taken was published in 1880 and could very well have been the one Holmes used at 221B to model his own variation. As he was nearly at the professional level in chemistry, it would have been quite reasonable for him to have fashioned his own – and probably more effective –variation on this elaborate setup. 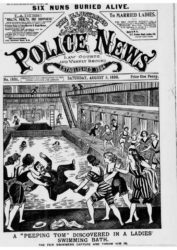 The Police Gazette or The Illustrated Police News were lurid examples of where Isla might have read of the more recent cases of Sherlock Holmes in advance of Watson’s writing them up, although small note of them might also have been made in a less sensational paper as well. 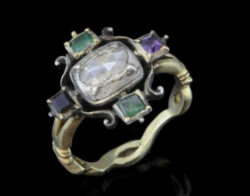 The “Famous Emerald and Amethyst Ring” that would surely have been on Isla McLaren’s finger had she been the wife of the eldest McLaren son might have looked something like this unique Georgian design with these stones surrounding a very large diamond. As opposed to these more common but nevertheless beautiful Georgian designs. 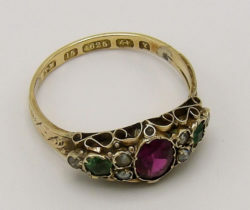 Rings boasting stones of many colors were very popular at the time. 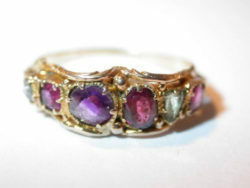 If it was an heirloom it surely dated to pre-Victorian times. The English government said “hell, no” or something similar to Alfred Nobel when he wanted to build an explosives factory there, but Scotland welcomed the renowned scientist/businessman, and he chose Ardeer for the site of his factory,a place isolated enough for safety, but not too far from either Glasgow or Edinburgh. There he produced its first nitroglycerine charge in January, 1873. “Nobel Explosives Company” grew over the decades to become the world’s largest explosives manufacturing site, employing 13,000 people (up from 50 in 1873)—many of whom rode to work on the company’s own train. The factory was self-sufficient in other ways, as well—conducting research, manufacturing most of its own parts and chemicals, maintaining its own power plant and water system, and shipping out detonators, dynamite, gelatin, cordite, gelignite, and other products on its own steamships. Nobel himself lived at Hawthorne House in Laurieston when he was in Scotland. 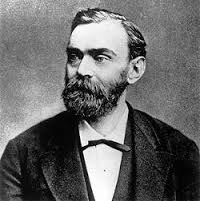 Alfred Nobel died in 1896, but Nobel Explosives lived on, and in some incarnation was a successful working factory well into the late 60’s .The site is currently abandoned. 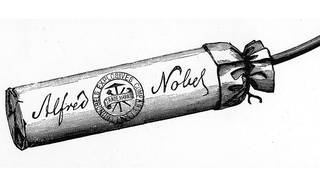 Before Nobel, if y0u wanted to blow something up you used black powder or nitroglycerin, both of might just as easily blow you up first. Nobel found that by soaking the nitgroglycerin in a kind of earth substance, it would be made more stable, creating something called “cordite” which looked a bit like spaghetti strands and would require a fuse cap to ignite. So when Mrs. McLaren pulls out her stick (which no doubt looked something like the one pictured) while it wasn’t casually dangerous as before, nevertheless spark or excessive heat could definitely cause trouble and it might not be something you should carry in your reticule. Nobel made so much money from his invention, and apparently felt guilty for its use in ways he had not intended, that he used his fortune to set up the the Nobel Prizes to support and glorify geniuses of the arts and sciences. 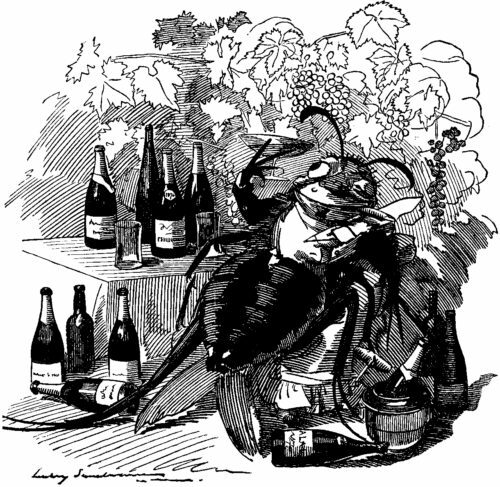 The vineyard scourge that Mycroft discusses with Sherlock was well underway by this time in 1889 and the French wine industry was in deep trouble. This small parasite had been brought in accidentally to France on the rootstock of some vines in America, where the grapes had immunity. At least it is assumed to have been an accident and by a horticulturalist, possibly British. No one is quite sure. While in reality, nothing that Mycroft says about the French suspecting industrial sabotage in the affair is on record anywhere that this researcher could find; that is not to say that it was not possible. As we all have seen repeatedly, any disaster can be turned to an international crisis if it serves some group of politicians. And this was no small disaster. Ultimately 40 percent of France’s grape crops were ruined, and the industry, so key to both France’s economy but also her identity, was in peril. But as for the Scots whisky barons taking advantage of the scarcity and rise in prices — that is verified. The relatively new whisky blend mentioned here (and a favourite of Watson’s we learn ) was developed by Canadian born Scot James Buchanan, and he managed to place it as the official whisky of The House of Commons. Pictured is a very early bottle with this designation proudly displayed. This was quite a coup on Buchanan’s part. Buchanan reportedly had the idea for its name after attending a dog show. 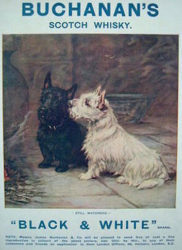 Later ads featured a black Scottie dog and a white Highland Terrier. Whisky “blends” were a new thing, devised by canny whisky marketers who discovered that the strong single malts (which were then called “self whisky”) did not suit the London palate. Another problem was that they needed consistency in their product as they expanded their markets and increased production. The blends were milder, softer, and easier to drink, and the flavour could be more easily modified to be uniform in large quantities. Like everyone in London, Holmes and Watson took their whisky with soda, as we hear in “The Red Headed League” and “The Noble Batchelor” A gasogene was present at 221B to provide the soda. That (and the very similar seltozgene) created bubbles in liquid by means of a mixture of tartaric acid and sodium bicarbonate that reacts to produce carbon dioxide. They were covered with a wire mesh because of occasional explosions. 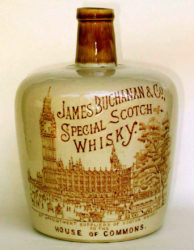 James Buchanan was one of several “whisky barons” who swept into London with the intention of placing their products in fine hotels, gentlemen’s clubs, theatres, music halls, and the like. Buchanan himself was a colourful, flamboyant character who dressed in a red waistcoat and rode in a re-wheeled carriage pulled by a matched pair. 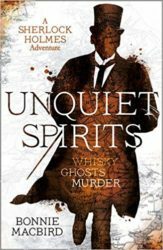 His rival was Tommy Dewar, an outgoing whisky salesman whose motto was “keep on advertising, and advertising will keep you”. Both Dewar and Buchanan pioneered marketing and sales techniques used to this day and together they (and a few others) elevated whisky to the status of an elegant social drink. Prior to this, to a Londoner, whisky was what manly men out hunting and fishing swigged from a flask. 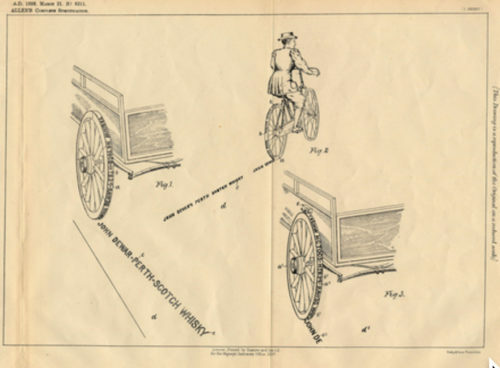 Perhaps one of the oddest advertising innovation was Tommy Dewar’s patent for an engraved wagon wheel which would leave a slogan cut into the dirt as it traversed the road. (see illustration) And it should be noted that the first enormous use of neon advertising signage was also by Dewar, as “Dewar’s” lit up the London skyline about fifteen years after this story. Ironically, both Buchanan and Dewar were awarded the title of baron, but as neither man had children, the title died with them. 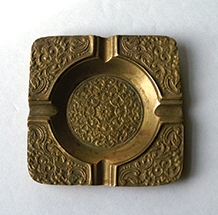 Ashtrays came in crystal, porcelain and a variety of metals, and were often sold as souvenirs at tourist destinations. One in a gentleman’s club such as the Diogenes, and specifically the one which facilitated Mycroft Holmes’ unusually aggressive act in this chapter might very well have looked like the one pictured. 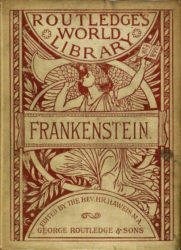 When Watson refers to Mary Shelley’s “intriguing novel inspired by Galvani’s electrical experimentation” this was, of course, Frankenstein, and the edition he was reading was likely to have been this from London, 1886. Shelley is credited as the first science fiction writer by many. 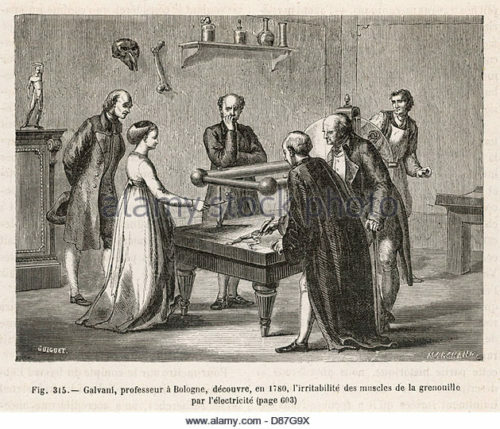 She was inspired by the eighteenth century scientist Luigi Galvani who famously discovered animal electricity with early experiments on frogs legs – which twitched when he touched them with two pieces of metal. It was thought that perhaps electricity was the key to life and this spawned a movement in which scientists wondered if the dead could be brought back. Montpellier was in Holmes’ time (and still is now) an internationally renowned centre for scientific research. 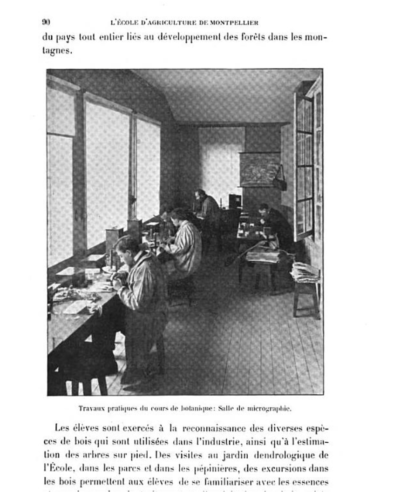 The leading laboratories combatting the phylloxera epidemic were located there. The town itself is of medieval origin and continues to attract leading scientists from around the world. We know from canon that Holmes at one time conducted research into coal tar derivatives in Montpellier, and that he was fluent in French. Watson has admitted that he disguises names, and perhaps “Dr. 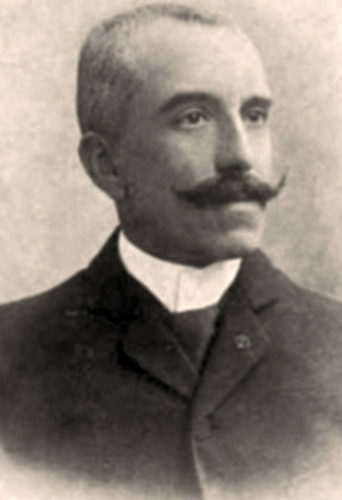 Janvier” was actually the very real Dr. Pierre Viala (pictured) French horticulturalist and hero of the battle against phylloxera. Dr. Janvier in this story mentions spending time in America (where he no doubt picked up the surprisingly un-French habit of working through lunch) and of course Pierre Viala was sent there in 1887 to search out phylloxera resistant grape varieties so this is likely the same man. Phylloxera Vastatrix is a small parasite that kills grapevines by sucking the sap from their roots. 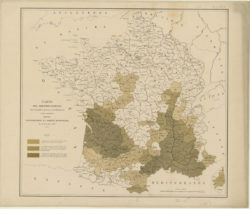 It was so bad in France that in 1895 only 42,500 hectares remained under vine, down from 280,000 in 1877. In 1888 the Viticulture Committee was formed and Viala was tasked to bring back the bug-resistant American seedlings for grafting purposes… with the ultimate goal of retaining the special flavour of the French varieties. It did not work right away, because the rootstocks that he first brought over could not survive in the relatively chalkier French soils. Another problem was in the long testing process needed to assess the various solutions to phylloxera. The French farmers and vintners were a highly superstitious lot. Poisonous toads, were among the many odd things tried. This resistance to science, coupled with lengthy growth seasons and the time needed for wine maturation made scientific progress on the problem slow going. 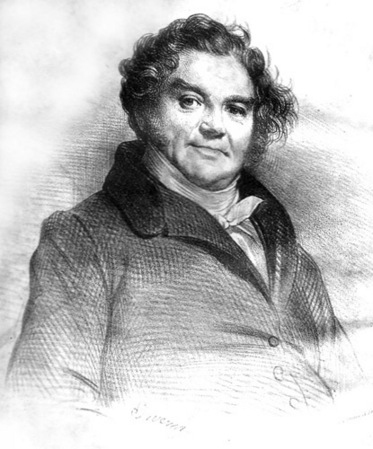 “Jean Vidocq” claims to be the descendant of the great Eugène François Vidocq (pictured) the founder of the Sûreté (and sometimes colourful criminal and con artist) who lived at the early part of the nineteenth century. 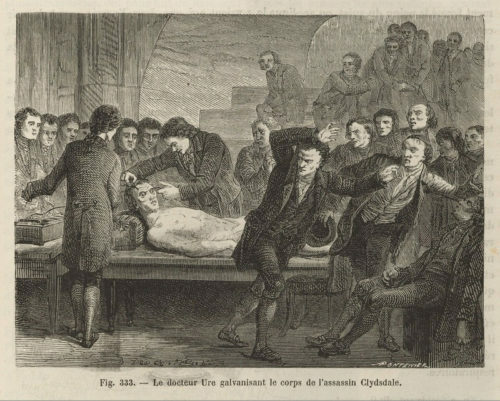 This real Vidocq pioneered forensic techniques and might be thought of as a kind of spiritual ancestor of Holmes, although with a decidedly darker aspect to him. But.. he had no descendants, and so the connection to “Jean Vidocq” of our story is spurious. Jean Vidocq made trouble for Holmes and especially Watson in ART IN THE BLOOD, and it is with no pleasure that they find him embroiled in their business again here. 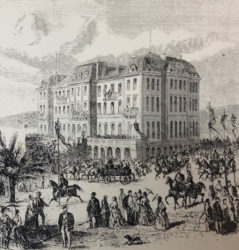 At the time of our story, this glamorous Riviera hotel where Holmes and Watson share the eventful dinner with the McLaren family had been open for less than a year. Located in picturesque Antibes, near Nice, the Hotel du Cap-Eden-Roc, began its existence in 1870 as an artist’s retreat built by the founder of Le Figaro. 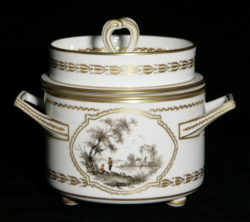 Ice cream was well known by this time and pictured is a rather fancy Victorian era ice cream maker from France. 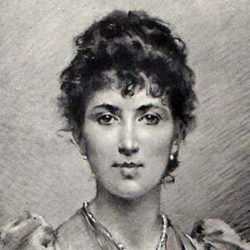 The “Queen of Ice Cream” was an attractive Englishwoman named Agnes Bertha Marshall, who lived at the same time as Holmes and Watson and in Fitzrovia not far from Baker Street, where she ran a cooking school. Marshall allegedly invented the ice cream cone, which she called a “cornet”. 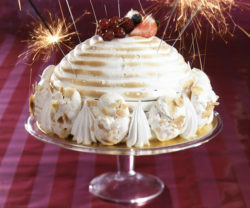 She also authored several books on frozen desserts, no doubt containing at least one recipe for a “bombe”, a French ice cream dessert so named because of its round, domed, shape, rather like a “bomb”. 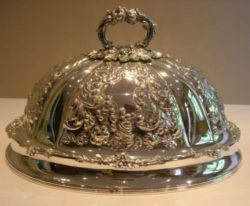 Pictured is a modern version complete with sparklers, but decorated old-school style with a meringue cover and embellishments… and …a typical serving platter. 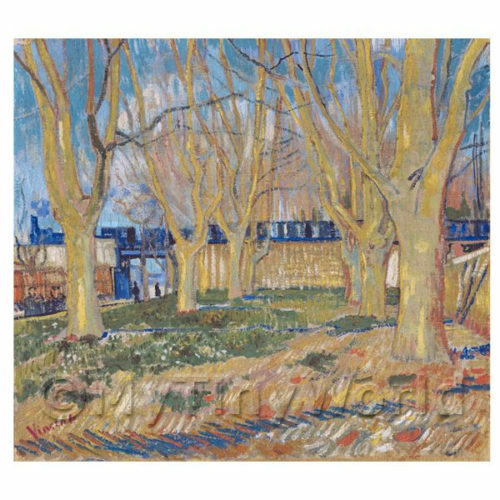 Watson at least looked forward to a ride home on a first class train, and although this picture is of much later vintage, there was a luxury conveyance, painted blue, that ran at this time from the north to Nice – and Van Gogh painted it in the Spring of 1888, as it passed over the Viaduct at Arles. This work currently hangs in the Rodin Museum in Paris. 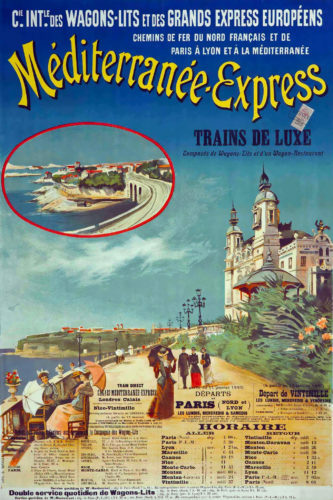 The Calais Méditerrannée Express began in the winter of 1886 from Calais to Nice, but by 1889, the name had been changed to simply the Méditerrannée Express, and the train began in Paris ( the northern leg having been taken over by another train). 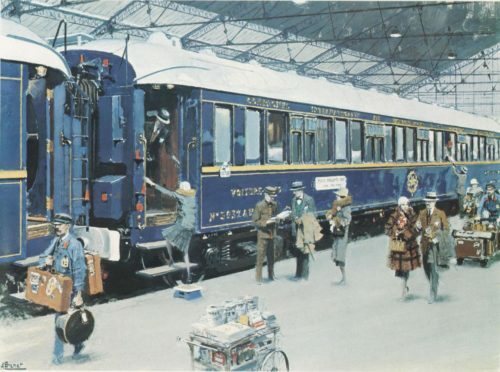 While Holmes and Watson generally travelled first class as evidenced by the Paget illustrations, Le Train Bleu was a class beyond, and probably out of their reach at this point in their careers (and especially at this precise moment, when both were a bit short). 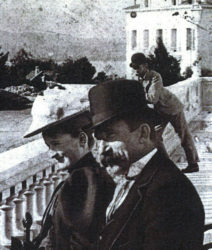 The French Riviera in 1889 was a popular destination for the chic and wealthy English aristocrats. As she had with Balmoral, Queen Victoria had helped popularise the area by her own frequent stays in Nice, and many followed suit to spend part of their winter among the palm trees and sunshine. The Blue Train was “the” way to go. Now there is an elegant Belle Epoque restaurant of that name in the Gare de Lyon in Paris, an evocative location where the Sherlock Holmes Society of France holds events. 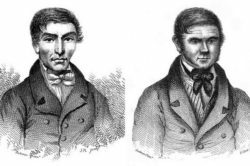 These two, mentioned by Watson, were the famous grave robbers and murderers who created a briefly profitable business of selling cadavers (some of whom they conveniently manufactured from living folks) to Edinburgh medical schools earlier in the century. Alistair McLaren’s alma mater is located in St. Andrews, Fife, Scotland, and was founded in 1410, as a way for Scottish students—who, due to war with England, had been forced to leave Oxford and Cambridge—to study at home, rather than travel to France. While best-known for its divinity school, the medical school was well respected, and the school also boasted excellent courses in natural history, chemistry, and mathematics. 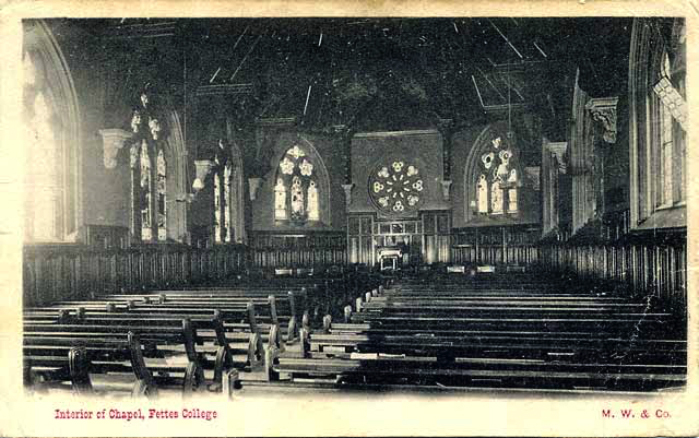 In 1877, St. Andrews began to offer the LLA, or “Lady Literate in Arts,” a series of courses women could take at their local colleges, with examinations offered at various centres around the country. They began to admit women during the 1892-93 academic year. Perhaps this progressive attitude predisposed Alistair’s attraction to the brilliant and challenging Isla. 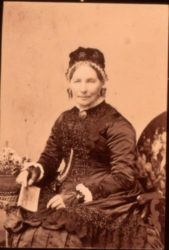 Famous St. Andrews alumni of the 19th century included surgeon Joseph Bancroft, B.C. Forbes (founder, Forbes magazine), author Andrew Lang. 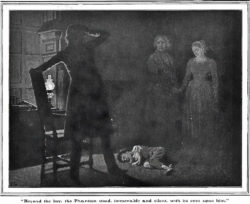 Trust Sherlock Holmes—a man who does not believe in phantoms and is familiar with the stage—to know about the stage trick “Pepper’s Ghost” – which uses mirrors and a dark room and seems absolutely to make a ghost appear nearby. (This trick is also featured in the BBC Sherlock episode “The Abominable Bride”). 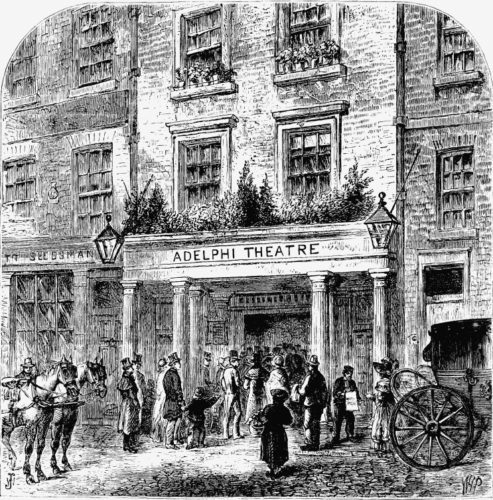 Made popular in Victorian times, the startling effect debuted onstage on Christmas Eve in 1863, in a production of Dickens’ “The Haunted Man” at the Adelphi Theatre in London. 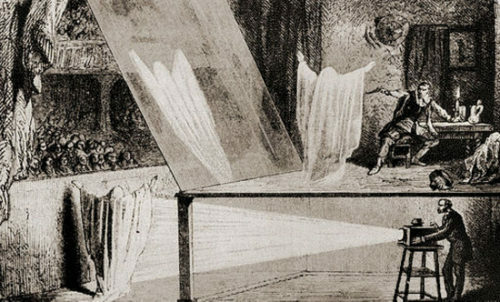 In 1862, inventor Henry Dircks, working with phantasmagoriam or “magic lanterns” which projected scary figures for an audience, rediscovered the illusion but his version was too impractical and he was unable to sell it to theatres. But when Professor John Henry Pepper, director of the Royal Polytechnic institute modified the trick, it became easier to mount and soon thrilled London audiences. Dirks and Pepper patented the process a month later. Unfortunately for Dircks, “Pepper’s Ghost” rolled off the tongue so easily that his connection was completely forgotten, no matter how many times Pepper himself tried to correct everyone. Dircks eventually signed over his financial rights to the patent to the Professor. The illusion uses a room set up to the side of (or below) the stage, dark and out of sight of the audience (the “blue” room)—and a plate of glass (or similar material) angled so that the audience cannot see either. When it’s time for the “ghost” to appear, lights go up in the blue room, and dim on the main stage, so that an image of the actor portraying the spirit is reflected by the glass onto the stage. That image may be projected and still – or for better effect, a live actor who could move. If the blue room is furnished in a mirror image of the onstage set and a live actor used, it can even appear as if the “ghost” is interacting with furniture and live cast members. For Holmes, any apparition would immediately become a cause to look for a hidden space, with evidence of a reflective glass. He found no room in their hallway at Braedern to accommodate this illusion, which made whatever it was that Watson saw there …a bit of a puzzle. 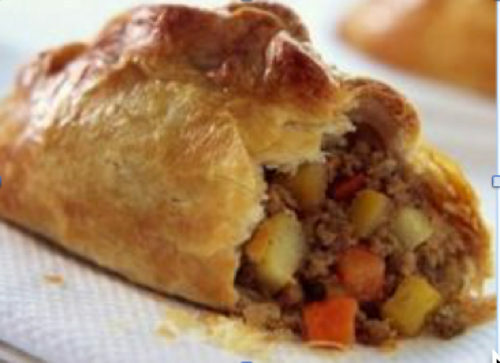 A “Bridie” is a popular Scottish street food, a meat pie in which a flaky or a shortcrust dough envelops a filling of minced steak, onion, butter, beef suet, and sometimes a few vegetables. It provided a tasty breakfast for Watson as he waited in Edinburgh for the photograph to be duplicated. The unique, unusual structure that is Fettes College, looms over Edinburgh. Its architecture is a striking mix of French chateau, Scottish baronial, and Gargoyles Go to Town. It is now a highly respected institution, and has always had a rather distinct personality, strongly slanted towards team sports. 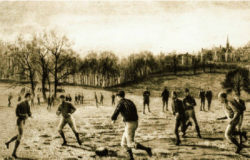 (Harrow field pictured, but at the same time as Holmes was at Fettes). It would have been a spectacularly poor fit for the young man who would no sooner be a jolly team mate than he would jump off a building. 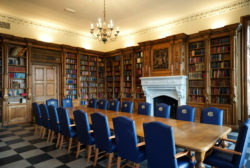 Instead, while there, Holmes spent his time in the library (here a contemporary picture but with original features intact, as well as in the beautiful chapel, which exists today almost exactly as it was in Holmes’ time, which was the perfect haven of privacy and good acoustics and likely where he went to practice his violin. Most individual sports were discouraged as promoting selfishness and ego, except for boxing, and it was here that Holmes first took up the sport which was to save him on numerous occasions later. 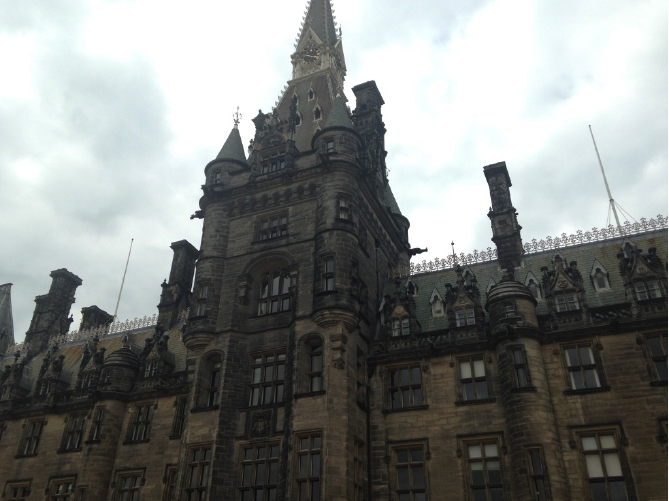 Long after Holmes attended, Fettes was the inspiration for two other authors of novel series. Ian Fleming made Fettes the alma mater of James Bond, and the college was reportedly the model for Hogwarts. 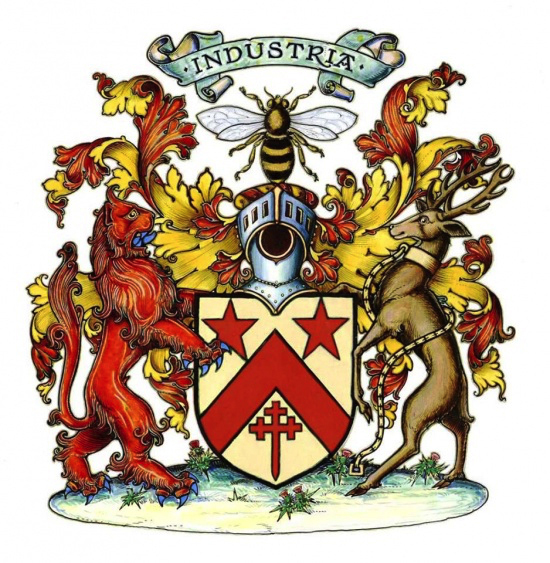 But a third surprising fact was this: the motto of Fettes is Industria, and the logo features the…honeybee. Many readers will know that Sherlock Holmes later retired to beekeeping in Sussex. Could he have been inspired first at Fettes? Before refrigeration, huge blocks of ice were used in “ice boxes” in the pantry or kitchen to keep food cool during the summer months. On larger estates ice was imported (sometimes from quite far away) and stored underground in ice houses, even as far north as the Highlands. Pictured is an ice house on the grounds of Castle Fraser in Aberdeenshire. 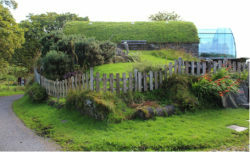 The structures were often fanciful in design, looking like small cottages sunk half way into the ground. The Queen imported her ice from Massachusetts. 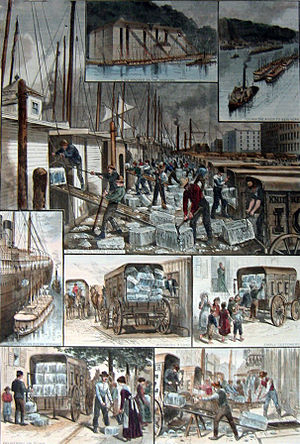 Wenham’s sold their ice from a shop in London and shipped all over Britain. Naturally, wealthy families emulated her in this and many other ways. The ice was stored underground to keep cool, and inside these small ice houses were deep pits, often two stories or more, and lined with wood, brick, or cement. Pictured are a couple of these pits. 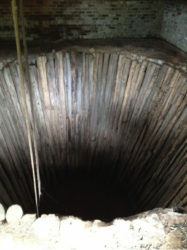 The pits often had platforms built around them, ladders, and sometimes pulleys used in collecting the ice. Sometimes these pits were dug under the house or castle itself, but more frequently were separate structures. They were kept locked, as the danger is quite obvious. In the winter there was no need for ice, as food pantries could be kept cool enough to keep food fresh. The ice house would have been partially depleted from the previous summer and left more or less during this time of year. During the time of Queen Victoria, her passion for Scotland and all things Scottish led a fashion revolution for tartan and anything evocative of the Highlands, a trend which filled some Scots with pride, enriched quite a few, and mightily embarrassed others, as it does to this day. 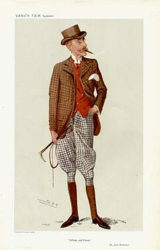 Kilts were worn for dress occasions, though, and when the McLarens deck themselves out for the grand whisky tasting in pursuit of Royal Warrant, they most likely wore the full monty. Pictured is a very extreme example of that from exactly the era of Watson’s tale. It was not at all common to include a pistol, but Sir Robert McLaren evidently did, and one is pictured here, which is proof that this was sometimes (if rarely) the case. Although Sir Robert’s must have been more modern, given the speed with which he made use of it. 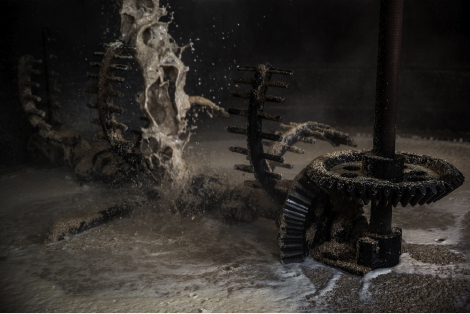 When whisky is matured in casks which have previously been used, the flavour is subtly altered by the residue inside. 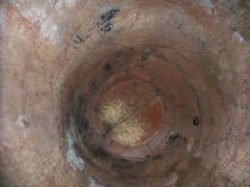 Sherry and Bourbon casks are more commonly used to age whisky, and additionally the insides of the casks are sometimes charred as well. When whisky has a distinctive smoky flavour,which has been much favoured in recent years, it has been imparted by burning peat and smoking the grain during the drying process. Many other things affect the flavour of whisky including the proximity to the sea, the exact barley used, the length of time for maturing and the type and previous contents of the cask, , the temperature in the maturation warehouse, and more. 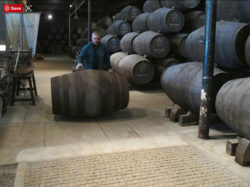 Pictured is a man rolling a “port cask” and the size of these was slightly larger than some of the others and could easily hold the contents described in the story. Holmes is known to have enjoyed a glass of port wine. 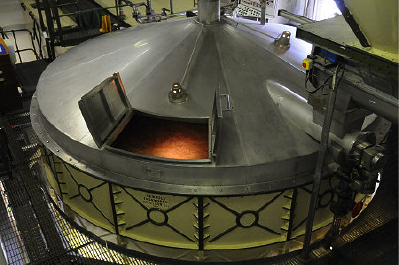 An example of a mash tun, and the mash tun rakes. The rakes would have been submerged most of the way into the liquid, but are shown here to give a sense of their size and power. These rakes are at the Bruichladdich Distillery in Islay, where the Victorian equipment is still in use. Ally Sloper comic of Christmas, 1889. 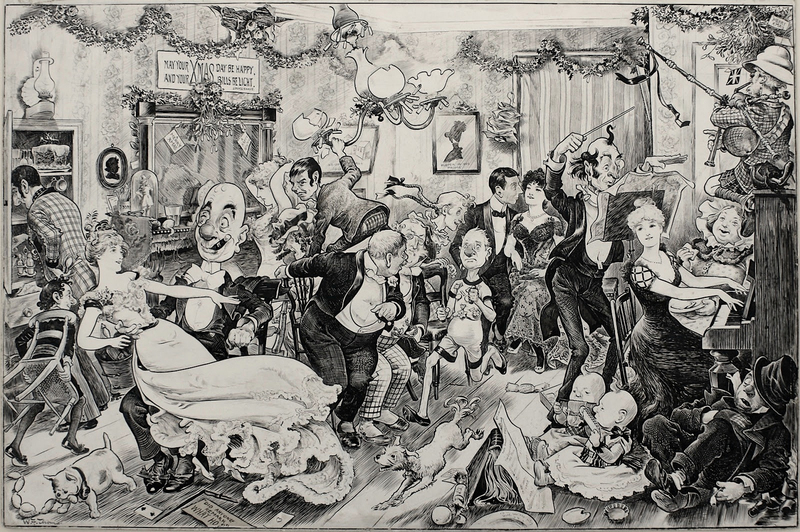 This 1889 image from the well established “Ally Sloper” series of comics gives a rough idea of exactly what did not go on at 221B at Christmastime. It does however parody the side of Victorian life that was slightly different from the commonly seen, and rather sickly sweet Christmas cards of the era. It is hard to imagine the man in a tee shirt, shorts, and cleated running shoes in 1889, and yet there he is. Everyone’s favourite relative, staying true to himself while others, er, celebrate. But what was Christmas like on Baker Street? Holmes, solo at 221B would have perhaps had a goose or a small roast, a candle or two, and a bit of holly along the sideboard. 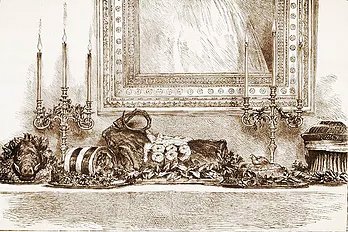 Pictured is Queen Victoria’s Christmas sideboard of 1889. Holmes would have had a similar, but very pared down version of this, if he celebrated at all. Perhaps he did. And with a lovely glass of whisky mixed with soda from his gasogene.